We have two separate accounts of the temptation of our Lord Jesus in the New Testament, Matthew and Luke both relating His experiences at that time. It has often been noticed that the order of the tests is not the same in each of these gospels. This does not, however, imply any contradiction, but simply that in the one gospel, Luke, we evidently have the moral order of the temptations and in Matthew the historical. We are told that our blessed Lord was “tempted in all points like as we are, apart from sin.” Actually there are only three points on which anyone can be tempted. All temptation appeals either to the lust of the flesh, the lust of the eye, or the pride of life. That is, there is the fleshly, the aesthetic, and the spiritual or intellectual temptation. It was in this way that Eve was tempted in the garden of Eden, and she capitulated on all points. She saw that the fruit of the tree was good for food; that was an appeal to the flesh: that it was pleasant to the eye; that was an aesthetic appeal: then that it was to be desired to make one wise; this, of course, was an appeal to spiritual pride. Our Lord resisted on every point and so demonstrated the fact that He was the sinless One. He was born into the world as the holy One, and holiness repels evil. In Adam unfallen we see humanity innocent. When fallen, humanity sinful. In our Lord Jesus Christ we have humanity holy. The question is often asked, “Could our Lord have sinned? If not, why the temptation, and what was the virtue in His standing?” The answer is clearly this: He was not tempted to find out if he could sin, but to prove that He was the sinless One. It was like the acid test for the gold, which demonstrates the purity of the metal. We need to remember that the Lord Jesus was God and man in one person. He was not two persons in one body. It is unthinkable that He could sin so far as deity is concerned. God cannot be tempted with sin. Had He been only a man He might have been put on trial like Adam and failed. But because He was God and man in one person He could not sin. There was, of course, in Him no evil nature, but there was none in Adam before he yielded. If our Lord had inherited fallen human nature, if there had been in Him any tendency to sin, He would have needed a Saviour Himself. Because He was the absolutely sinless One He could offer Himself a ransom for our souls and so bring fallen humanity back to God. We are told in the epistle to the Hebrews that He suffered being tempted. On the other hand, Peter tells us that “He that hath suffered in the flesh hath ceased from sin.” These two passages bring out most vividly the difference between Christ and ourselves. We suffer by resisting temptation and so are enabled to cease from sin, but temptation caused Him the keenest suffering. As the holy One he could not endure this contact with satanic suggestion without suffering inward distress. We are told that “Jesus, being full of the Holy Spirit, returned from Jordan and was led by the Spirit into the wilderness.” This in itself is most suggestive. Acknowledged by the Father as His beloved Son in whom He had found all His delight, sealed by the Holy Spirit and thus marked out as the Messiah, the anointed of Jehovah, He as led by the Spirit into the wilderness of Quartania, according to accepted tradition, in order that, through the temptation, it might be demonstrated that He was in very truth the holy One, who was thus suited to offer Himself a sacrifice on behalf of those who are unholy. Standing in the ruins of the recently uncovered city of Jericho and looking up upon the bare, desolate mount of Quartania, in the wilderness of Judea, my own heart was deeply stirred some years ago, as I thought of my blessed Lord spending forty days there with the wild beasts of the wilderness and without food. What a contrast to Adam the First, who was placed in a garden of delight, with every creature subject to his will and provided with everything needful to sustain and strengthen him physically! Jesus stood every test, fasting in a wilderness among the wild beasts because He, Adam the Second, was God’s blessed, eternal Son become flesh for our redemption. We are told definitely that He was forty days tempted of the devil. Let me emphasize that. There are those today who deny the personality of the devil. They say that all the devil there is, is the evil of a man’s own heart, his own wicked desires, his own evil thoughts. 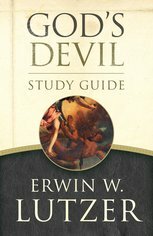 In one great religious system, which has been taken up by multitudes, the teaching is current that if you just cut the letter “D” out of the word “Devil” you will find what that word really represents. The devil is simply the personification of evil. Actually, they tell us, there is no personal devil. Have you ever thought what that implies? 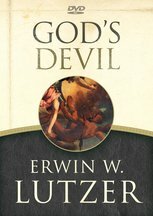 First of all, it implies this: all the wickedness, all the vile iniquity, all the abominable filth and the dreadful corruption that have characterized the most vicious men and women during the millenniums of history have come from their own hearts without any tempting spirit to incite to these excesses. That is the worst indictment of the human race that anyone ever dreamed of bringing against mankind. It implies that man’s heart, in itself, is so utterly evil that it needs no outside incentive to produce the unbelievable vileness which has polluted the pages of human history. Surely, no stern, hyper-Calvinist of Reformation days ever brought as strong an indictment against humanity as that! And yet, because error is never consistent, the very people who teach this tell us that all men are children of God by natural birth, and deny the necessity of redemption and of regeneration! But then there is more than this to be considered. The denial of the personality of the devil is positive blasphemy against our Lord Jesus Christ. Here we are told that He was led into the wilderness to be tempted of the devil. Dare we say that this means He was to be tempted by His own evil thoughts, by the wickedness of His own heart? We have already seen that there was no wickedness there. He was the pure and sinless One. Yet He was tempted of the devil. He Himself tells us elsewhere that the devil abode not in the truth, that he is a liar from the beginning, a murderer, and that there is no truth in him. Note these personal pronouns. Our Lord Jesus recognized in Satan a sinister personality, the foe of God and man. The question may be asked,” Why, then, did God create such an evil being? Why did He ever bring a devil into existence?” He did not create him as an evil spirit but as a pure and innocent angel. He abode not in the truth. Like all the other angels, he was created in innocence, but temptation came, the temptation to exalt himself and so he fell and became the enemy of God and man. His judgment has already been declared, but before it is carried out God has chosen to permit him a certain measure of power and liberty in order that men may be tested to find out whether they prefer Satan’s service or whether to live in loving devotion to the God who created them. You may take your choice, but if you choose Satan as your master here you must share his doom for eternity, for hell was prepared for the devil and his angels, that is, his messengers. Now notice the order of the temptations as here given. Satan came to Jesus when He was hungry, when physically he was weakest. This was the opportunity to present to Him the appeal to the lust of the flesh, if there had been anything in Him contrary to the holiness of the Godhead. So the devil said to Him, “If thou be the Son of God, command this stone that it be made bread.” To have yielded would have been to accept a suggestion from Satan and thus to take Himself out of the hand of God. There was not the slightest tendency to do this. Jesus met the tempter with Scripture, saying, “Man doth not live by bread only, but by every word that proceedeth out of the mouth of God doth man live.” There is something more important than bread to sustain the body, and that is the Word that sustains the spirit. So the Lord Jesus repudiated the suggestion of the devil. He had no word from the Father commanding Him to change stones into bread. He would not put forth such power in obedience to Satan. Alas, how often have we who profess His name failed in similar circumstances. We have reached the place of grave extremity in some experience of life. Satan presents an opportunity to propsper through doing something that is a little bit off color and that is not quite in keeping with the full Christian profession. How many a child of God has failed right there and has allowed himself to take up with shady or crooked, in order that he might procure more of the bread that perishes, only to find out at last that he breaks his teeth upon the very stones which he attempted thus to change into food. That is not God’s way. He does not call upon His people to make bread out of stones. He feeds us both naturally and spiritually as we labor day by day for that which is for our blessing. There is something more important than bread, and that is to do the will of God. The second temptation was the attempted appeal to the lust of the eye. From a great and high mountain in marvelous vision Jesus looks over the whole world. Satan shows Him all the kingdoms of the earth in a moment of time. He declares that all this belongs to him, he is the god of the world, he is its prince, men have surrendered it to him, and he says “to whomsoever I will I give it. If thou wilt therefore worship me all shall be thine.” It was the offer of the kingdom without the cross; but there was no inward response on the part of the Saviour. He had come into the world not only to rule as King, but first to give His life a ransom for many, and Satan’s suggestion makes no impression upon Him whatever. He replies, “Get thee behind me, Satan, for it is written, thou shalt worship the Lord thy God and Him only shalt thou serve.” He recognizes at once who the tempter is, calls him by name, spurns his suggestion and again triumphs through the Word. The day will yet come when the kingdoms of this world shall become the kingdom of our Lord and His Christ. In that day Satan himself will have to acknowledge that “Jesus Christ is Lord to the glory of God the Father.” All created intelligences will prostrate themselves before Him, even though many of them will do it with weeping and gnashing of teeth because of the rebellion of their hearts. The third test was an endeavor to appeal to the pride of the natural heart, something which our blessed Lord knew nothing of. He could ever say, “I am meek and lowly in heart.” We are told that Satan brought Him to Jerusalem and set Him on a pinnacle of the temple and said unto Him, “If thou be the Son of God cast thyself down from hence.” Impudently he quoted Scripture, a portion of the Ninety-first Psalm, as an assurance that if our blessed Lord did this He would be held up by angel hands and would not suffer death. Cunningly he omitted the most important part of the passage. Try to imagine just what was here suggested. Think of a great throng of people gathered in the temple courts, and our Lord looking down upon that worshipping multitude from one of the highest heights of that noble building. Remember He has come to present Himself as the Messiah of Israel. Now Satan pretends to cooperate with Him and suggests “Here is your opportunity to prove to the people that you are really the Son of God and their promised Messiah. Leap off the pinnacle of the temple: let them see you being sustained in mid-air by angelic hands. Then they will know that you are what you profess to be.” It did indeed seem from a natural standpoint to offer a remarkable occasion for the Lord to demonstrate His Messiahship. Notice exactly how Satan misquoted Scripture to back up his suggestion. He said, “It is written, He shall give His angles charge over thee, to keep thee, and in their hands they shall bear thee up lest thou dash thy foot against a stone.” Our Saviour recognized the misquotation at once and saw through the Satanic suggestion as an appeal to spiritual pride. The devil said, as it were, “I am only asking you to do what Scripture warrants: leap from the pinnacle of the temple and count upon God to fulfill His own Word and to protect you from harm.” But if we turn back to the Ninety-first Psalm we will find the passage actually says, “He shall give His angels charge over thee to keep thee in all thy ways.” These last four words Satan cunningly omitted. It could never be part of the holy ways of the Son of God to try to put His Father to the test in such a manner as that suggested by Satan. Jesus, however, did not argue the question with the devil. He just met him with another Scripture. He answered saying, “It is written again, Thou shalt not tempt the Lord thy God.” That is, it is never right to do anything just in order to see whether God will keep His Word or not. It is never necessary to do that. He can always be depended on to do as He has said. Had it been part of the ways of the Son of God as planned by the Father that He should leap from the pinnacle of the temple and be supported by angelic hands, Jesus would not have needed to get instruction from Satan. He came to do the Father’s will and in doing that will He could always depend on the Father’s sustaining power. As an illustration of tempting God, let me refer to some strange things that have taken place recently in our Southern Mountains. There is a sect of fanatical people down there who have sought to test God on a promise given by the Lord to His apostles that they should be able to tread upon serpents and that the bite of the serpent would not harm them. So in weird meetings conducted by these ignorant people, many of whom could not read or write, the teaching was given out that if one was really a Christian the bite of a rattlesnake could not hurt him, as God had promised protection. A number of instances have occurred wherein live rattlesnakes were brought into the meetings and certain leaders actually permitted these writhing reptiles to bite them and hoped thereby to demonstrate their invulnerability to serpent poison. Several died because of it, others suffered terribly but were eventually freed of the poison though proper treatment. The Government had to interfere because of the folly of this sect. It was all a matter of trying to put God to a test, and, of course, God would not respond to anything of the kind. But now contrast with this that which happened to the apostle Paul on the island of Melita. As the shipwrecked sailors were warming themselves around a fire, there came out a viper and fastened itself upon Paul’s arm. The people expected him to fall down dead, but he threw the reptile off into the fire and was himself unharmed. God kept His Word, but Paul did not attempt to put Him to a test. And so in our Lord’s temptation in the wilderness, Satan endeavored to trap Him on every point, but He proved Himself to be the holy One in whom was no inward desire to yield to any other direction than that given Him by the Father. Satan failed to make any impression whatever on the Son of God, and then we read, “He departed from him for a season.” He returned again from time to time and sought through enraged and fanatical unbelievers to put Him to death before the cross, and in Gethsemane and again when our Saviour was actually nailed to the cross Satan sought once more to thwart the purpose of God, only to be defeated each time. The great lesson for us is that our Lord Jesus, who was tempted in all points like as we are, apart from sin, lives in the glory today and is able to exert His mighty power on our behalf and to succor us when we are tempted. Whatever the trial or test we may have to face, let us remember that He stands ready to come to our relief, to give to us strength through the power of the Holy Spirit, that we may resist temptation and not dishonor our God and Father through our failures.